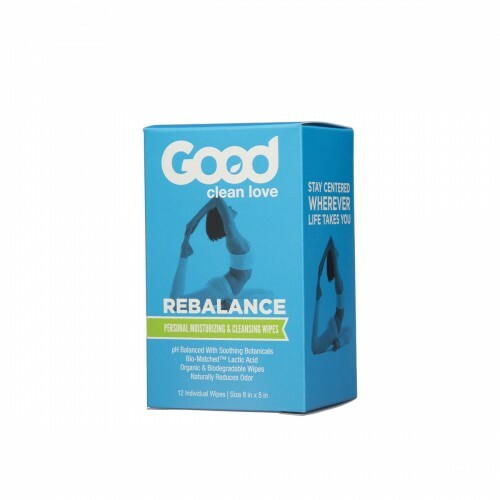 Rebalance Moisturizing Cleansing Wipes 12 ct.
Rebalance™ Personal Moisturizing and Cleansing Wipes help cleanse, refresh, eliminate odor, and they’re biodegradable. Individually wrapped, these pH-balanced wipes will keep you feeling refreshed and cleansed wherever life finds you. They’re great for travel, post-workout, after an intimate moment, and everyday on-the-go cleansing. Our unique Bio Match™ feminine odor products are formulated to closely replicate the healthiest vaginal conditions to support your natural healthy vaginal ecosystem.